Bustling Barcelona and museum-laden Madrid top the list of just about every traveler to Spain’s list. With Spain recently overtaking the US as the world’s second most visited country, it’s worth seeking out destinations beyond Spain’s well-trodden tourist paths. The Province of Málaga, with its year-round temperatures and sunshine that earn the Costa del Sol its name, is a great choice for a long weekend getaway filled with good food, adventure and a bit of luxury. Málaga isn’t jam-packed with monuments, which makes the city perfect for a long weekend break coupled with day trips to Spain’s famous and formerly dangerous Caminito del Rey and the beautiful clifftop town of Ronda. Head to the port city as your base for these things to do in Málaga. This 3-day guide includes the following recommendations for things to do in Málaga. You can jump to a specific site or activity by clicking the links in the table of contents below. 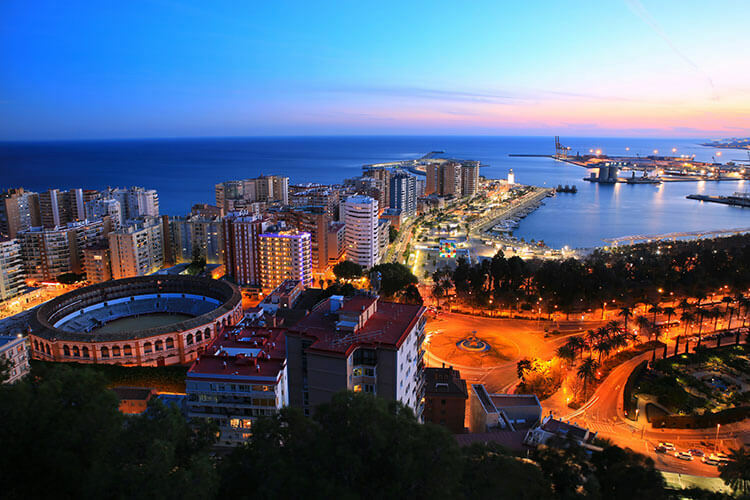 The city of Málaga is the gateway to the Costa del Sol. Most visitors make a beeline from airport to beach resort, the city barely getting a second glance in their rear view mirrors. But the once shabby port city has gotten a makeover and it’s worth exploring. Even in winter, the temperatures in Málaga are those of a perfect summer day. Not too hot, not too cold and beckoning you to be outside basking in the sun. 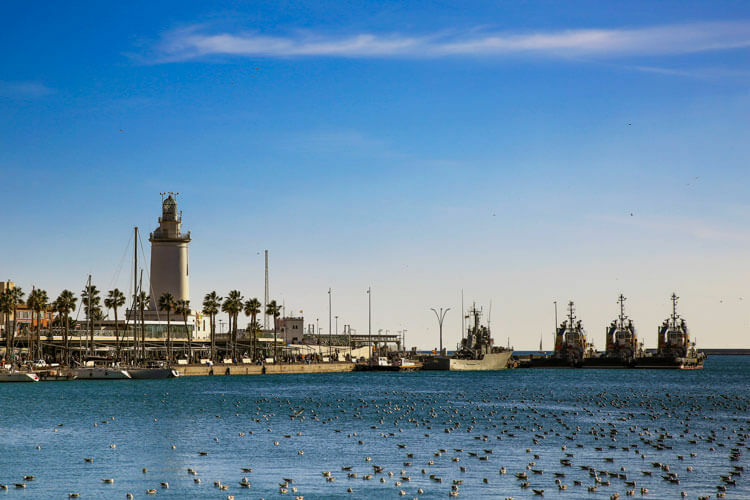 After a flight, we don’t always want to hit the pavement running and the Pier One Port of Málaga is a perfect place to punctuate strolling with sipping gin and tonics. This area of Málalga, bordering the old city, was one of the areas to get a major spruce up a few years ago. Locals and tourists alike love the seaside promenade, where it seems the entire city is out walking their dogs, biking or lounging in the sun. There’s shops, restaurants, cafes and bars lining the promenade. Stretch your legs on the walk, then relax at one of the many bars where the gin is generous. High above the port, the 14th-century Castillo de Gibralfaro stands watch over the coast. It’s one of Málaga’s remnants of its Islamic past and though just about nothing inside the castle is original, the ramparts provide one of the best views over Málaga and the Mediterranean. A path winds (steeply) up from the port through the Alcazaba, eventually reaching the castle. 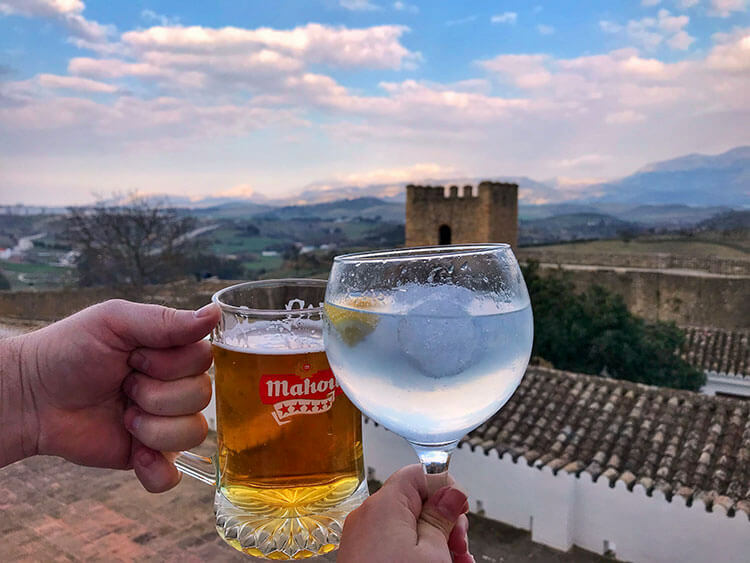 It definitely works off any gin and jámon you might have already had, or you can hop on the number 35 bus to the top. Though the castle closes at least an hour before sunset, this is still clearly one of the most popular places to take in sunset in Málaga. There’s a terrace just below the castle ramparts and the scene is worth elbowing your way in among the crowd that gathers as the sky turns shades of pink, orange and purple. The tapas dishes are plentiful and three dishes were plenty to share between the two of us. Try the croquettes, sizzling prawns pil-pil and suckling roast baby goat with couscous. 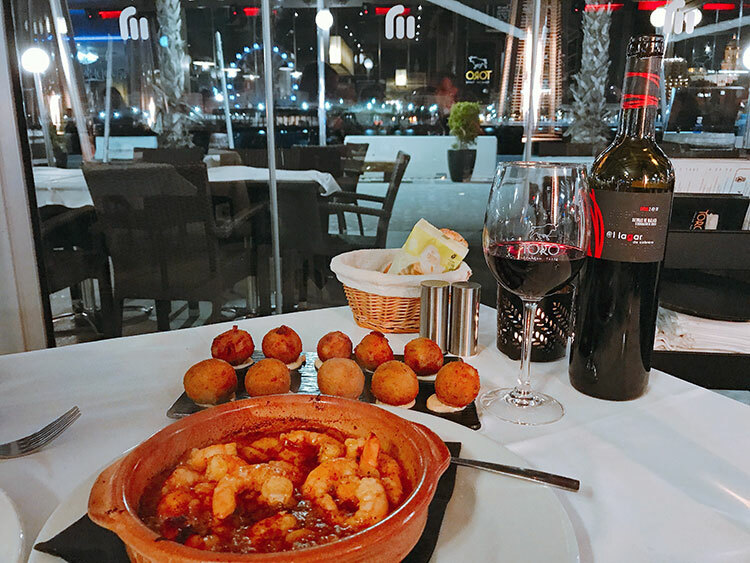 Pair it with a bottle of local Málaga wine. 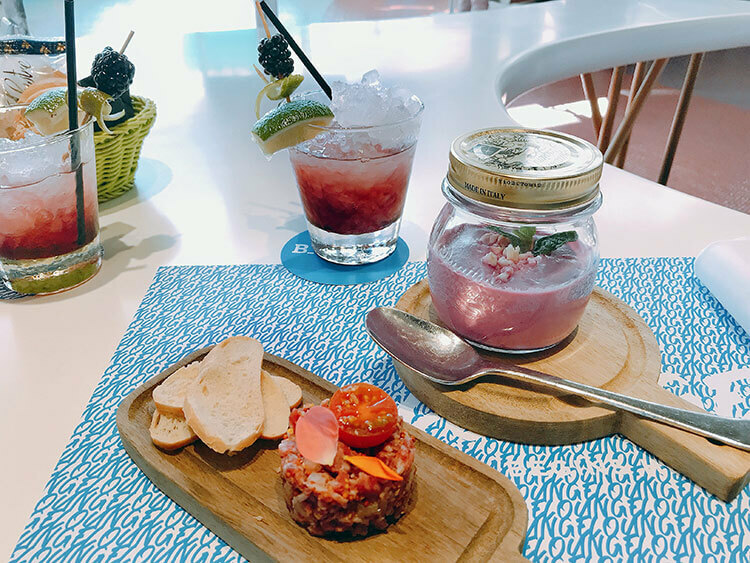 And if you’re looking for more recommendations of what to try and where to eat it, our friend Lauren (who owns the fantastic Devour Tours) has a fantastic guide to where to eat in Málaga. We asked for Lauren’s recommendations immediately when we started planning our trip. While Málaga is a lovely port city, it’s the beautiful mountains of Andalucia that we’ve come for. And getting outdoors is an excellent way to work off all the jamón ibérico and fried seafood you can’t help but stuff yourself full of. El Caminito del Rey, meaning the “King’s little pathway,” was built by the Sociedad Hydroelectrica del Chorro between 1901 and 1905. The pathway had two purposes. There was project to build a dam, an arch-supported aqueduct and over a kilometer of aqueduct tunnels, and materials needed to be efficiently transported for the construction. It was also built so that workers of the Salto del Chorro and Salto del Gaitanejo hydroelectric power plants could easily cross between them without going all the way around the mountain. Just one meter in width and over 100 meters (330 feet) above the river, the original pathway was built of concrete poured on top of three-inch steel rails. The steel rails were supported by stanchions built at 45-degree angles in to the rock face of the gorge. 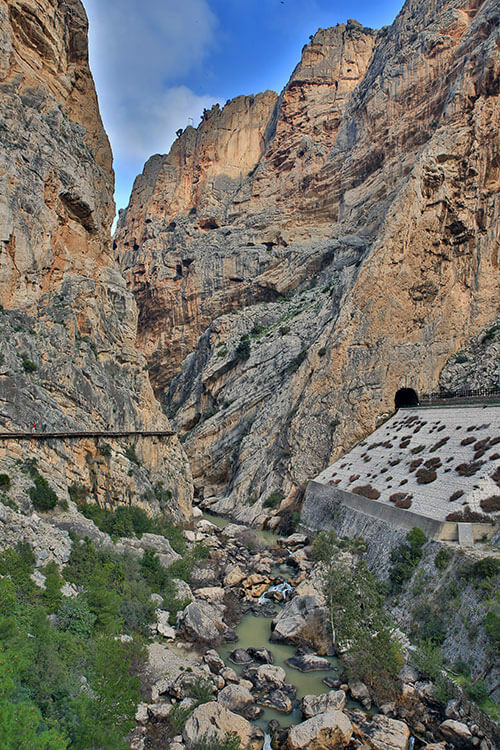 The pathway became known as El Caminito del Rey when King Alfonso XIII crossed it during the inauguration of the Conde del Guadalhorce dam in 1921. The original pathway quickly fell out of use. It decayed in varying states over the years since it hadn’t been maintained since the 1920s. Some parts of the concrete path collapsed entirely, leaving nothing behind but the steel rails. In other places, the concrete was polka dotted with holes of varying sizes. And there were few places were the original hand rails still existed at all. A safety cable bolted in to the rock face did run the length of the pathway, though its integrity was questionable at best. Even so, Caminito del Rey was open to the public and a popular attraction. After a number of accidents, it was closed in the 1980s. But only a wire with a sign across the entrance to the path attempted to deter adventurous hikers and rock climbers. It was still accessible. After a fatal accident in 1999 was followed by three more hikers plummeting to their deaths in 2000, the local government closed the entrances on both ends. As a further deterrent, the first 30 meters of the pathway on the lake end was even entirely removed. And a €6000 fine was set for those caught trespassing. None of it deterred daredevils that didn’t mind flirting with death, though. Some locals even installed a via ferreta cable to access the pathway where the government had removed a section and would take people out – for a fee, of course. In 2011, the regional government of Andalucia and the local government of Málaga came to an agreement to share the costs of restoration of the pathway. It wasn’t until three years later in March of 2014 that the restoration work finally began with the laying of the cornerstone. It was completed and re-opened to the public in May 2015. 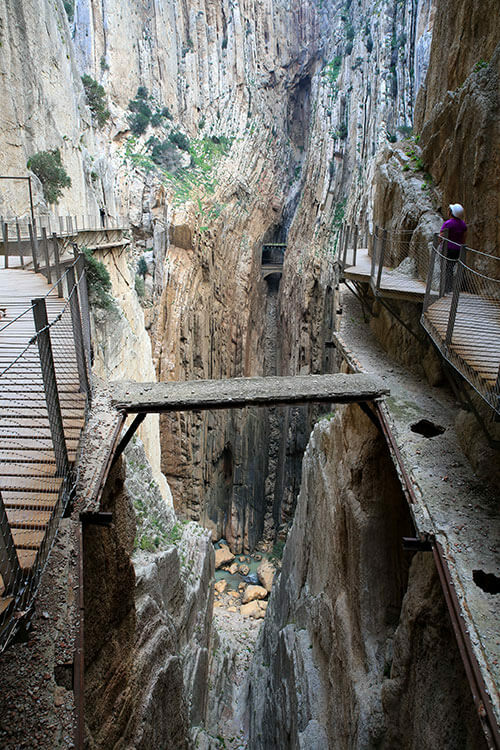 While it’s no longer the “world’s most dangerous walkway,” Caminito del Rey’s setting isn’t any less spectacular. The wind still whips through the canyon and the rushing sound of the Guadalhorce River below reminds you that you’re still 330 feet above a boulder strewn gorge on a narrow walkway built from wooden planks. The new pathway was built directly over the old, crumbling pathway and you can see the rusting, decaying bits below you as you move along the 1.5 kilometers of boardwalks. 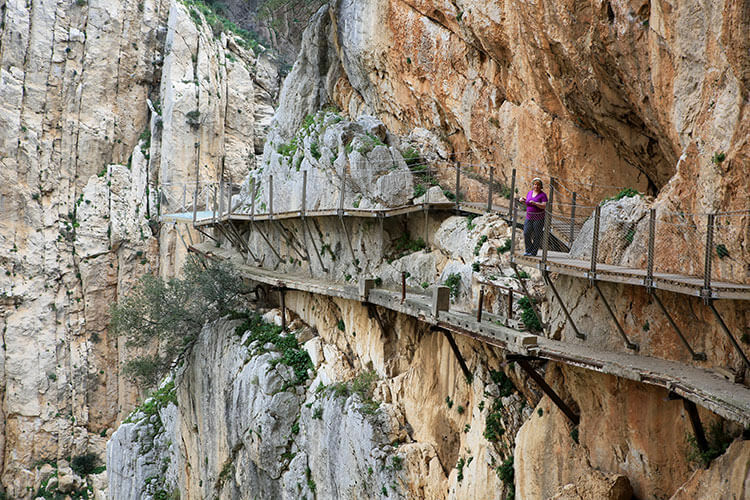 The walkways are definitely the most famous part of Caminito del Rey, but not the only part. A forest trail separates the two sections of boardwalks and passes by ruin houses and even through a small section of the old aqueduct. The hike actually begins well before you even reach the new control cabin. Following a sign, the adventure begins through a borehole in the mountain. The light fades away as you walk through the dark toward the other end, and emerging a few minutes later to a dirt path running high above an azure reservoir. 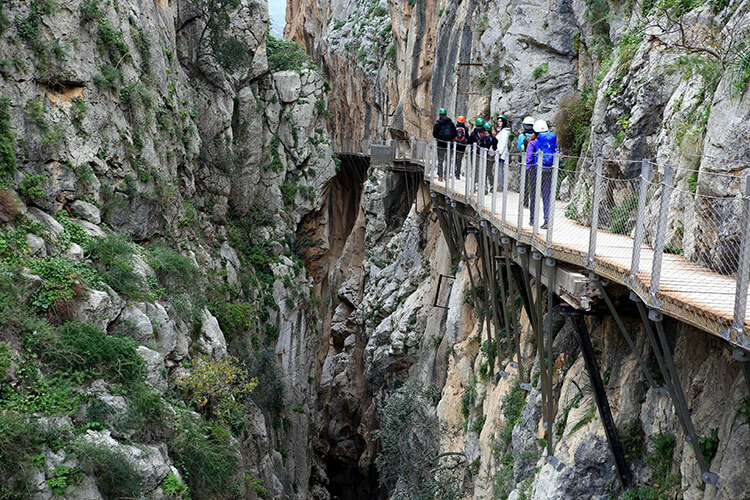 This path is around 2 kilometers before reaching the actual entrance of Caminito del Rey. Once reaching the control cabin, ticket holders have a timed entry – so don’t be late. There’s a maximum of 1100 people admitted per day in order to preserve the new pathway and area. Once you reach the north entrance control cabin, you’re provided with a helmet and a hair net that must be worn while on Caminito del Rey. It’s to protect against falling rocks from above while on the boardwalks. Once passing the south entrance control cabin, it’s just a little more than 2 kilometers to the meeting point where the bus shuttles hikers back to Restaurante el Kiosko. In total, Caminito del Rey is 7.7 kilometers (almost 5 miles) and it takes between 3-4 hours to complete. 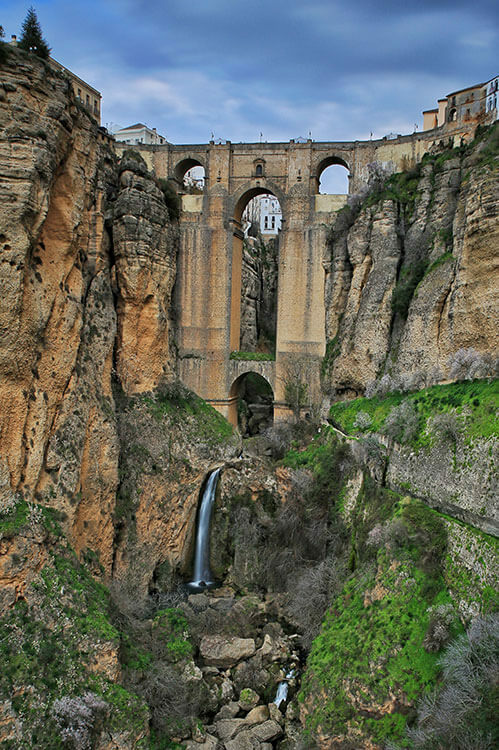 Ronda is one of Andalucia’s most emblematic towns. The sight of Puente Nuevo spanning the gash in El Tajo gorge carved out by the Río Guadalevín is, quite literally, breathtaking. Just one hour drive from Caminito del Rey, Ronda simply shouldn’t be missed. It’s one of the oldest towns in Spain, first settled by the early Celts in the 6th century BC. Originally called Arunda by the Celts, Ronda got the name still used today from Julius Caesar when the Romans founded it and fortified it during the Second Punic War. Ronda has a dramatic history and would change hands many times between the Visigoths, Moors, Christians and eventually the Spanish. But much of Ronda’s Islamic architectural heritage came under the Moor rule, which can be seen in La Ciudad (the old Moorish town). This is the land of pueblos blancos, the famous white houses of Andalucia stunningly perched atop cliffs. A walk through La Ciudad reveals terraces just beckoning you to rest your weary feet for a while to take in the view. The pueblos blancos stretch out on the landscape beyond the lower part of the town, known as El Barrio, where you can still see parts of the old walls. The Puente Nuevo (New Bridge), sort of a misnomer since it was actually built between 1751 and 1793, is actually just one of three bridges that span El Tajo. It connects La Ciudad with El Mercadillo (the New Town), which sprang up after the Christian Reconquest of 1485. A set of a couple hundred stairs lead from El Mercadillo down to the canyon floor, offering spectacular viewpoints of the Puente Nuevo and the waterfalls. Back up top, you’ve definitely earned a pastry. Try a Goyesca Dulce, a typical sweet kind of like a cookie from Ronda with honey, almonds and chocolate. We got ours from Albaceria Gourmet Delicatessen just at the edge of Puente Nuevo. In El Mercadillo the Plaza de Toros de Ronda is the main sight. Built from 1779 – 1784, it’s the oldest bullfighting ring in Spain and was designed by the same architect that built the Puente Nuevo. Though bullfighting dates back to the Visigoths in the 5th century, Ronda is considered the birthplace of modern bullfighting. The Romero family of Ronda were some of the most celebrated bullfighters and produced three generations of bullfighters, including Pedro Romero. He’s touted as the father of modern bullfighting, having killed some 5600 bulls in Plaza de Toros de Ronda during his career. The official inaugural corrida is considered to have been on May 19, 1785 with Pedro Romero battling his rival Pepe Hillo. An inauguration did take place upon the ring’s completion in a year earlier in 1784, though part of the stand collapsed and forced the ring to be closed until repairs could be made. Plaza de Toros de Ronda is rarely used today, and functions more as a museum for tourists to visit. 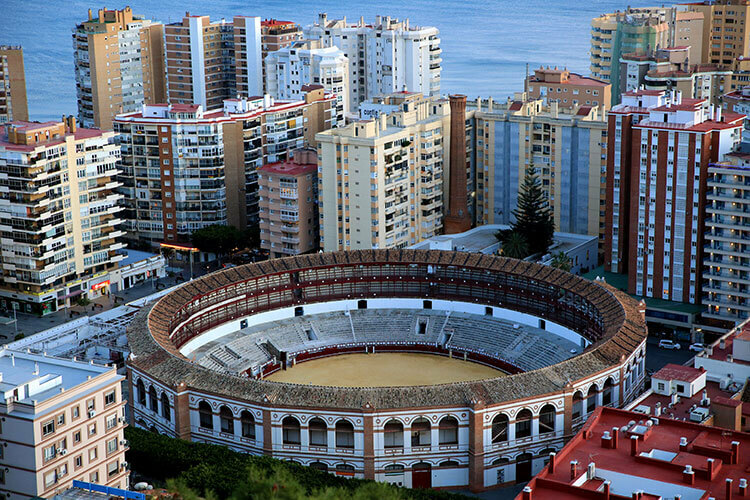 Madonna did shoot her music video for Take a Bow in the bullring back in 1994 and each September the bullfight during the Feria de Pedro Romero takes place here. By now, you’ve no doubt worked up an appetite. Head to dinner at Tragatá, a small tapas restaurant just opposite the parador and before the Puente Nuevo bridge. You might find the Asian-Spanish fusion a bit unusual, but the prices are good and the restaurant is consistently rated highly. Try the fried calamari sandwich – the roll is made with squid ink. Málaga’s beaches aren’t anything to write home about, but we can never resist hanging out at the sea anyway. If you’re up for it, head a couple kilometers out of the city center to the old fishing village of Pedregalejo. Here you find traditional beach fish restaurants where the sardines go straight from sea to skewer to be grilled up for hungry guests. 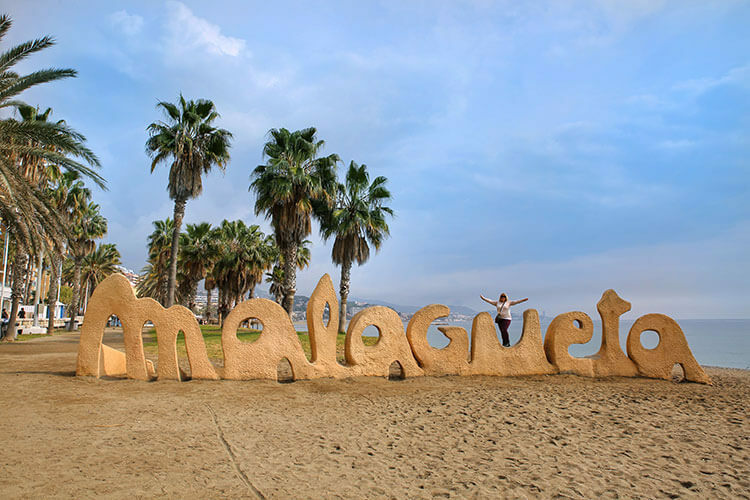 If, like us, your feet are just worn out from all the walking on Caminito del Rey and Ronda, head to Malagueta Beach just on the back side of Pier One. It’s the city’s main beach, and you can even find some chiringuitos (fish shacks) here, too. The trick to ordering at the chiringuitos near Malagueta beach is to ensure you get fresh fish by asking what the fresh catch of the day is and watching what they’re grilling up on the barbecue. 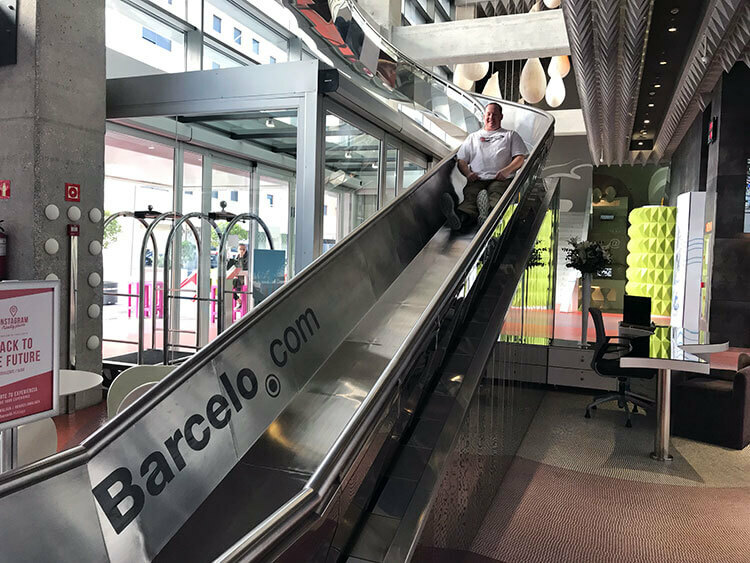 Barceló boasts unusual stays and it’s pretty obvious from the giant, spiraling slide in the lobby that you’re in for a totally unpretentious, yet luxurious stay. That slide is actually an artwork by Jordi Torres called Sliding Structure for Daring Humans, but guests still use it and we made a trip (or three) down it to the lobby. There’s 221 guestrooms and we stayed in a junior suite on the eighth floor with views out to the beach and Mediterranean. The beds are comfy with a big pile of pillows, just the way we like it. 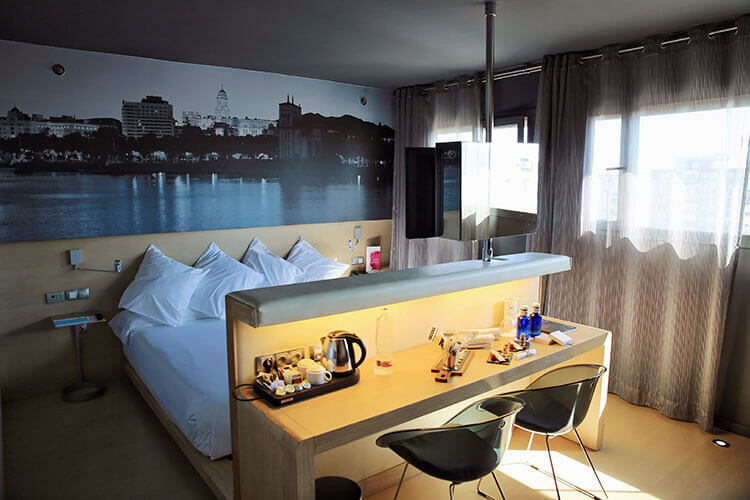 The bed and seating area is separated by a desk, where there’s a swivel tv. The bathroom has a jacuzzi bath with a separate shower that has both an overhead rain shower and handheld shower. Perhaps our favorite feature of Barceló Málaga are all the treats left throughout the stay. Turn down service included bottle of fresh fruit infused water one night, and milk with chocolate rice krispies the other. Smoothies and planchas of jámon and cheese were left midday. 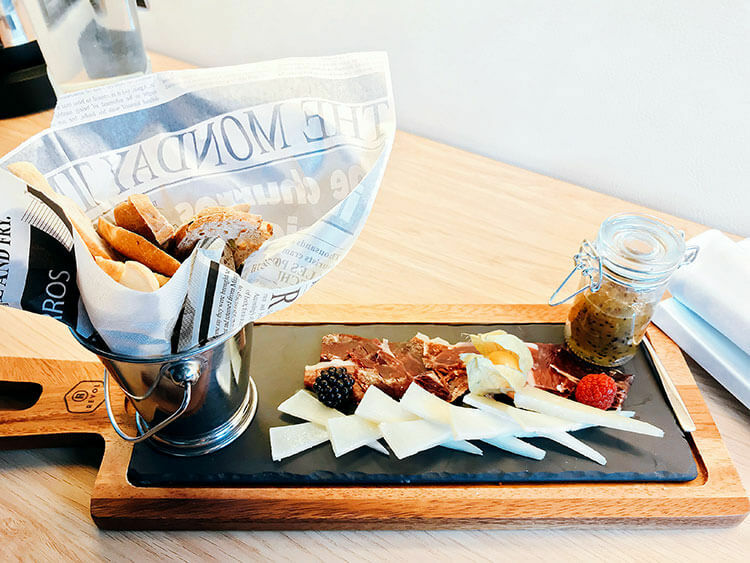 Breakfast is an ample buffet with healthy options like fresh pressed juices and chia, along with a good selection of charchuterie, hot dishes and pastries. There’s also a station with eggs cooked to order. And best of all, breakfast is served late on weekends until 11 and until 10:30 during the week. Try the kitschy mosaic tiled B-Lounge in the hotel lobby for cocktails, like the locally produced Simbuya gin cocktail. Simbuya Purple Gin is made exclusively from purple carrots grown in Cuevas Bajas, Málaga. The cocktail is made with a syrup of berries made by the hotel, the Simbuya Purple Gin and a sugar syrup, then garnished with lime and more fresh berries. Definitely the best gin cocktail we had while in Spain. Barceló Málaga is directly connected to the Málaga María Zambrano train station, making an excellent choice if you’re arriving by train. It is about a 15-20 minute walk in to the city center from the hotel. There is also a car park at Pier One Port of Málaga, making it easy to drive in to the city center and find parking. Málaga is well-connected by flights and by high speed train. Caminito del Rey is best reached by car and car rental is available from many companies right at Málaga–Costa del Sol Airport. There are day tours that include transportation from Málaga to Caminito del Rey if you don’t want to rent a car or you can also take the train to El Chorro Train Station, then take the bus from the town to the North access point. There are also trains that travel from Málaga to Ronda in about 2 hours time. 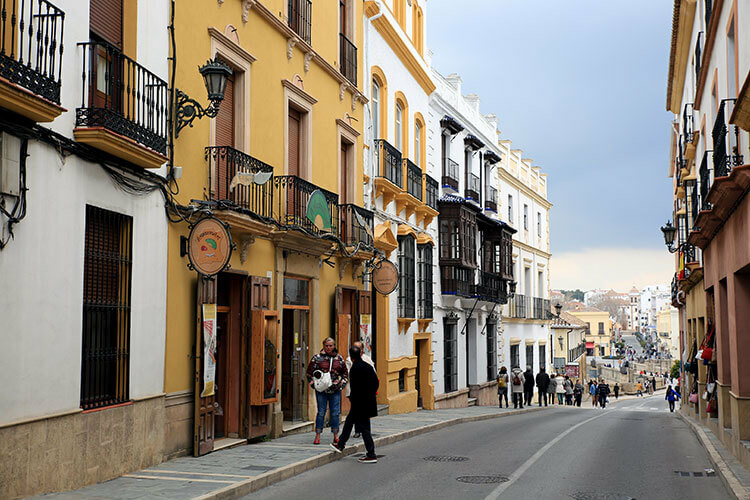 Málaga is an excellent base for exploring the city, Caminito del Rey and Ronda. Barcelo Málaga is located just a few minutes from Málaga’s center and is steps away from Málaga María Zambrano train station. Tickets are required and book up well in advance. There are two options available: general ticket for €11.55 including the bus ride back to the entrance or the guided tour in English and Spanish for €19.55 including the bus ride back to the entrance. All tickets include a helmet and hair net that must be worn. The guided tour is a group of up to 25 and gives information on history and geography of the area. You must arrive at least 30 minutes prior to your timed entry. It’s about a 2 kilometer (1.25 miles) walk to the control cabin. North entrance hikers should part at Restaurante el Kiosko. 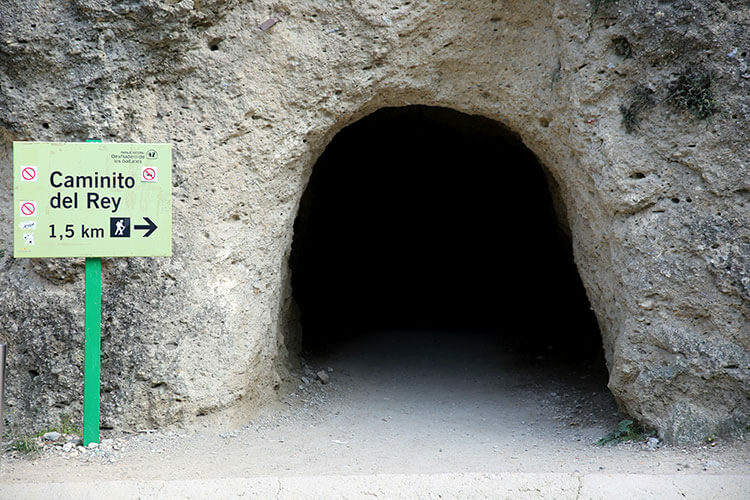 The cave entrance is about 200 meters from the restaurant and this is where the bus drops you back off. My parents have been to Malaga and can’t stop talking about it. They always say it’s an awesome place and now, after reading your post, I’m itching to go! I had no idea that Spain is becoming the second most visited country in the world! Spain has just recently overtaken the US as the second most visited country. And we have so much of Spain yet to explore! But we’re already itching to go back to Málaga to do some more hiking and via ferrata there. Andalucia does have a couple of UNESCO sites, but none are in Málaga province. We’re usually pretty good about making sure we visit any UNESCO sites in the destinations that we visit. I knew Malaga to be a port city and having the old town feel but what I did not know is that it has mountains too! I love your picture of Puente Nuevo, it looks like a perfect day trip. I plan to visit Spain soon and Malaga was definitely on my list but I haven’t started researching yet on things to do, so this is a great start for me. Bookmarking this post, thanks! We’d definitely recommend spending the night in Ronda. We wished we had done that since Ronda is so picturesque! Spain is high on my wish list and it is good to know that it has over taken USA. Thanks for introducing me to this new place called Malaga which has so many things from mountains, beaches to history and heritage. I would love to be there someday and explore all the places especially Castillo de Gibralfaro and board walk in Caminito del Rey. And yes will try local wine too. The story of El Caminito del Rey is truly fascinating! The views definitely deserve the hike! I’ve seen some videos on social media about Ronda and I’m dying to visit this city. It is so unique! The Málaga region sounds like a lovely jumping off point for the region! I especially like the sound of the temperate weather, even in winter. I would love to watch the sunset from the terrace below Castillo de Gibralfaro, then go for tapas at Toro Muelle Uno. It’s always good to know which restaurants are good, especially in more touristy areas. The background of the Caminito del Rey is so interesting! It’s sounds like the restoration work was a good move by the local government to make locals and travelers happy, and safe. The views from the path look spectacular! Ronda looks stunning too. Thanks for introducing me to this lesser visited area of Spain! Malaga has changed a lot since I was there when I was a kid. 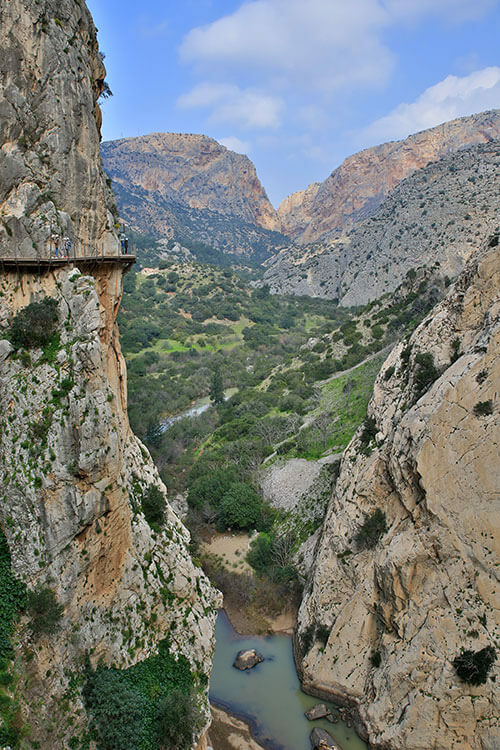 And now with el Caminito del Rey as a new attraction there are even more reasons to choose Malaga as basecamp. Did you find it that scary? I like the idea of preserving the former caminito below the new one. Málaga looks so nice! 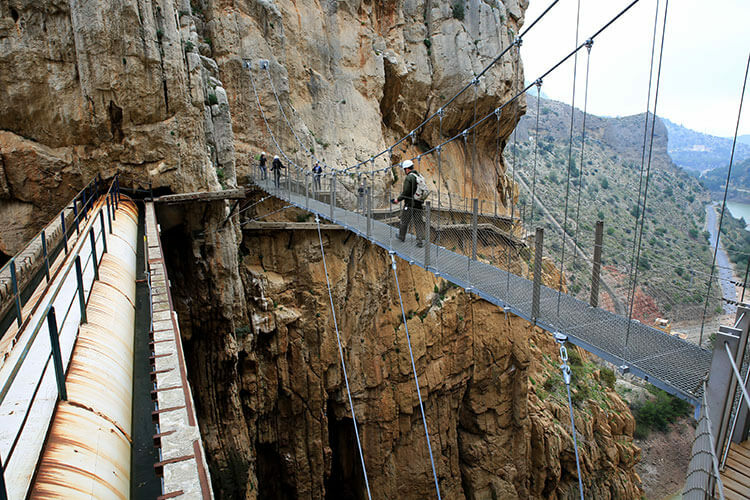 The walk at Caminito del Rey looks really fun, I will be doing this when I go. 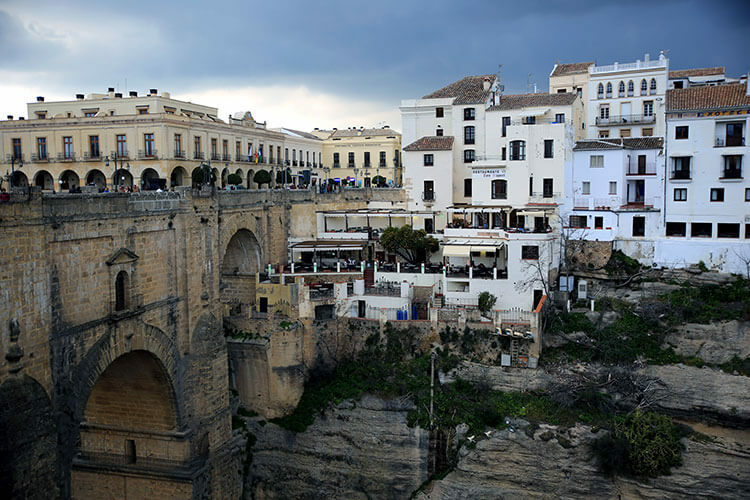 The town of Ronda is so beautiful and can see myself enjoying a day there with a nice tapas lunch and a glass of wine. I had never heard of this area of Spain before. Found Barcelona to be a bit too touristy and overcrowded so this looks like a great option next time. Would have to check out the Plaza de Toros de Ronda….looks like a Gladiator ring. Hotel looks great, I would definitely take a few trips on the slide and love the food bar area at the foot of the bed. We visited the Malaga area last summer after travelling through Spain. We loved the Caminito del Rey. It was one of the many highlights of our trip. There are tours that can take you from Malaga but we rented a car. The drive is easy and the scenery beautiful. You have to book advance tickets on their website if you want to ensure a spot. The added tour guide was great. The walk did take about 4 hours but it was fairly easy if you are a walker. Thanks for sharing your experience, Susan! If you’re keen to know the history and not research it on your own like we did, then we agree that the tour guide can be great for learning that info. what is the best way (and easiest) to get from downtown Malaga to Caminito del Ray? How far away is it?